Realizing that perhaps Nintendo was onto something with its Noble Pink DS, Sony's decided to one up their competition by releasing not one, but two consoles in the same shade. 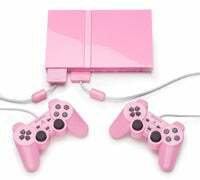 Debuting at this week's Leipzig Gaming Convention in Germany, the pink PS2 is not only shiny, but also cheaper than its predecessors. It runs for €159.99 or £129.99 in the UK, and also comes with a pink memory card and a pair of pink Dual Shock controllers when it's available in November. No word yet on North America, but we're well known to hate pink over here. Oh ho, but that's not all, my Sony-loving friends. In a Super Bonus Excitement Deal, Sony's also announced a pink version of their PlayStation Portable. Sadly, purchasers of this bundle will have to deal with unmatching white headphones. They'll also get a pouch, a wrist strap, and a 32MB Memory Stick Duo (no word on the color). And, as if that weren't enough, singer Pink will be packaging a UMD with her latest music videos. I kid you not. The pink PSP too is a Europe-only affair (hey, someone needs to cheer up that dreary continent! ), where it will run around €250. And as far as we know, the PS3 will not be going pink, but then again, who's to say?